How to use space cooperatively? The past few decades have seen a significant change in business types and sizes. Young entrepreneurs, filled with innovative and fresh ideas, now try to establish their own practices, shops, companies or similar undertakings. Meanwhile, rental fees for commercial spaces have increased; doubled or even tripled in some European cities over the last decades. Building owners also prefer to deal with a fewer number of parties while guaranteeing secured revenues, which favors big companies and chains, leaving start-ups with fewer opportunities to test their ideas. At the same time, start-ups deliver important impulse to cities. Small businesses add a local flavor and enrich the identity of places. A good mix of different scaled business and services is a key element of well functioning cities. The cooperative use of space can stregthen the smallest business activities. Entrepreneurship gets easier to try out, start ups can profit from actions set together. Sharing a commercial space can be translated as “raumteilen” in german. NORDBAHNHALLE is a vacant warehouse, which should have been demolished. It was turned into an urban lab to test interim use of vacant buildings. The research project “Mischung:Nordbahnhof” sstudies the spatial and economical needs of small entrepreneurs. The results will generate models and the right types of mixes for the Nordbahnhof district, which currently under development. The researchers of the project worked with both the private and the public sector. Their aim is to discover sustainable and affordable formulae to enable cooperation among all the players. The Raumteilerfestival served as an occasion to present the first results of the research and exchange with local and international experts. Check the activities in the Nordbahnhalle. Follow them on facebook and instagram. 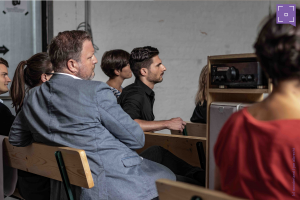 The research teams shared the old warehouse with various “Macherinnen” Through a call, an interesting combination of makers were selected to test their business ideas. The young entrepreneurs were given the opportunity to find affordable commercial space to work in, initiate and network through. The participants spanned across an interesting mix of start-ups. 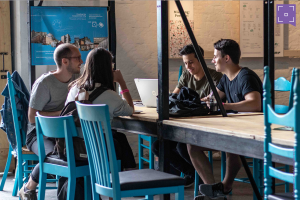 Nordbahnhalle offers breeding ground for unconventional business ideas, creative entrepreneurs, influencers, designers, handcraft specialists, developers, artists, and last but not least, socially inclusive projects. Christian Peer (TU Wien) explained how they conducted the research in Vienna’s Nordbahn area. He concluded that the demand for commercial space has changed, and that local entrepreneurs need new possibilities to share (Raumteilen) and increase the density of the services while ensuring rental rates are affordable. 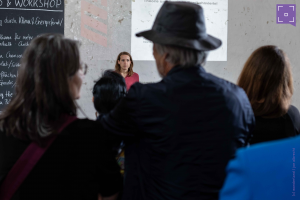 Silvia Forlati (TU Wien) ighlighted the new opportunities emerging with cooperative space use and Julian Junker (EGW) pointed out the difficulties in producing rooms that offer a fit all kinds of entrepreneurship endeavors and making commercial space affordable. Around 2.500 space-searchers employ the search services a the Wirtschaftskammer in Vienna. The demand for small and affordable objects in central locations to rent is very high, explained Silvia Spendier (Frei Lokale). Daniela Patti (Eutropian) ppresented two international examples of how cooperative entrepreneurs have a big impact on their neighborhoods. 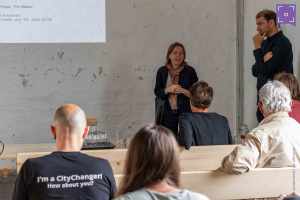 Patti is the co-founder of Eutropian and the online magazin cooperative city, as well as the co-editor of publications such as “funding the cooperative city” as well as the project leader of the project space team since 2011. She is specialized in urban regeneration and environmental planning. She has been working recently on the governance of Peri-urban landscape, the revitalization of local food markets and new economic and organizational models for community-based urban development. In Largo Residências, commercial use of the space entails financing the cultural and artistic uses. The newly established hub combines a hostel, hotel, artist-in-residence and café. 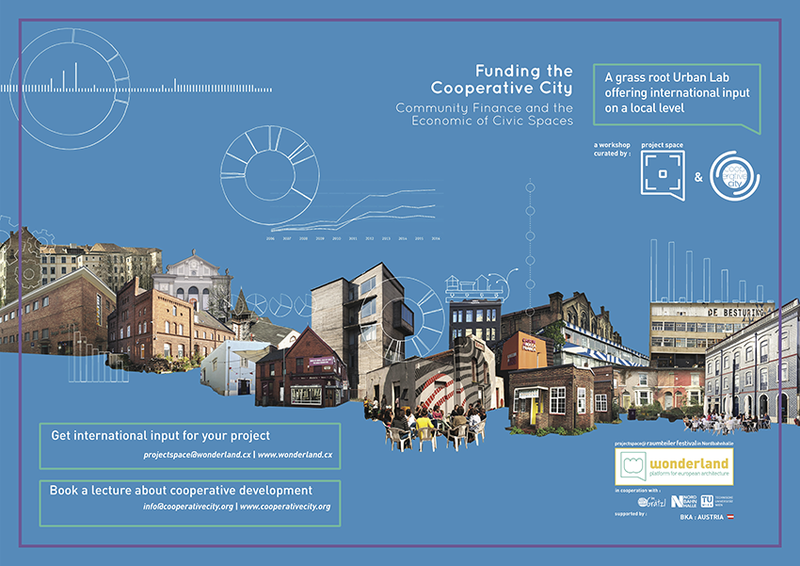 The cooperative brings jobs to the neighborhood, involves artistic and social creation while promoting the work to travelers from all around the world. Afrikaanderwijk Cooperative brings together existing workspaces, entrepreneurs, producers, social organizations and the market. The neighborhood had a bad reputation and had been suffering from problems such as a low level of education and high unemployment rates. The cooperative involves unemployed residents by utilizing their skills and competences in their actions. They established a neighborhood kitchen and catering company, a textile workshop, as well as a cleaning company. The aim of the project is to keep revenues in the area and create jobs for locals. 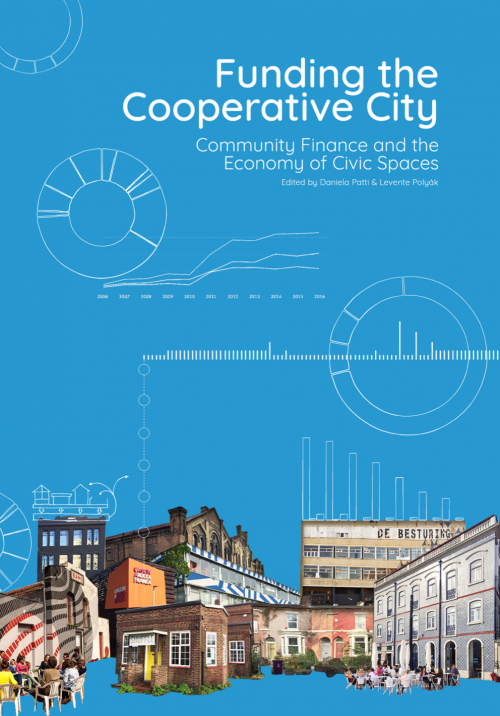 Subscribe for the cooperative city newsletter. Support the work. Download publications. Wonderland supports it’s members in the creation of socially inclusive and future proof projects throughout Europe. The Project Space fformat was developed to test global ideas locally and involve international expertise in local challenges. The Format brings international experts on site to exchange and inspire local actors in their challenges. The participative workshops allow the teams to engage with the neighborhood and administration to find unique approaches and solutions. If you need international input for your projects please feel free to contact us. Read more Project Space’s. Follow project space on facebook. Initiate a Project Space.